BusinessObjects access is granted upon approval for a Data Set role. The User Information section will default to the logged in users’ Uniqname. To enter a request for a different user, enter or lookup the Uniqname of the employee for whom access is being requested. Use the Filter to search for the applicable Data Set role in the Role Selection Tool section. 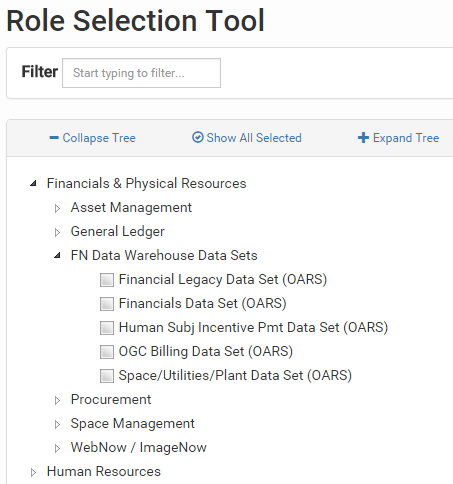 Click the expand/collapse arrows in the role tree to search for the applicable Data Set role by category. Click Show All Selected to view all of the employee's current roles. Any additional roles that are checked while creating the new request will also display. Click a role name to view a detailed description of the role. The filter will match on the role name or description, i.e, Viewer . Check the box for the applicable role(s). Repeat steps 3-4 for additional roles. Scroll down and review the Summary section to verify the accuracy of the request. Pay close attention to the Action column. If applicable, enter Additional Comments. Submit for Authorization - to submit the request for approval. Note For roles that have Secondary Securities, the request will not be submitted yet. You will be prompted to complete a Secondary Security form before submitting the request. Dismiss Request - to delete the request. Save - to save the request for submission later.